PEORIA – When Martin Luther was asked about the truest form of worship, he looked to the Parable of the Ten Lepers in Luke 17 as the best example. 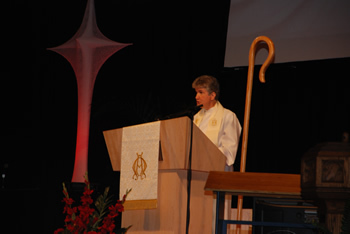 Tucker spoke at the annual conference memorial service June 2 which opened the 2010 Annual Conference in Peoria. The service opened with the Charles Wesley hymn, And Are We Yet Alive?, which has been a traditional song opening for annual conference and other Methodist gatherings for the past 300 years.